Water is a feminine element, warm and wet, the colour is blue and the direction is west. It is associated with phsychic energy, emotion, intuition, the subconcious, and cleansing. we all have water within us and are subject to it's ebb and flow. It is the element of reason. Both water and the west are associated with death - west is the place of endings, opposite the east which is the place of beginnings. Water is usually a soft and predictable energy, dealing with emotions such as love and joy, but water can also be associated with emotions of pain and sorrow. 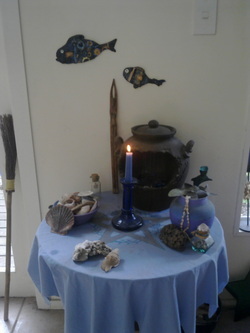 Altar tool - Chalice & water, Cup, cauldron, goblet, mirror. Chakra - crown. Elemental - Undines. Animal (Lakota) - Serpent, whale/ Bear Sabbat - Mabon. Solar midpoint - Autumn Equinox. Time of day - Dusk. Weather - Rainy. Function - Intuition. Sense - Taste. Tarot - Cups. Attribute - Emotional/fertile. type of magick - Mirror divinations, magnet work, love magick, lucid dreaming, cleansing, protection spells. Ritual action - Bathing, dilution, washing, sprinkling, preparing cold herbal infusions.